This Rick and Morty Mug is Ridiculously Cool | Nerd Much? This Rick and Morty Mug is affectionately punned as “A Head of the Game,” you know, since it’s Morty’s head and you can pre-order it, thereby being ahead of the game. The mug is ceramic and holds 28 ounces, which is quite large even though the picture makes it look a lot smaller. For reference, a large cup of coffee from your local coffee shop is anywhere between 12 to 16 ounces. 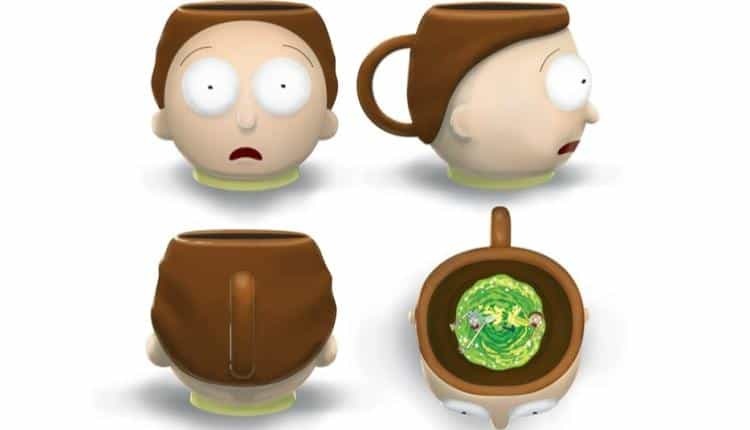 The head of Morty for this mug has the expression of being a little frightened, a suitable expression of you found yourself turned into a mug. Or you just had to bury your own dead self from an alternate universe. This isn’t just printed graphic on ceramic either, the shape of the mug is Morty’s head, eyes, nose, ears, and all. The handle is placed in the least awkward place on the back of Morty’s head. Within the mug at the bottom is a swirling green vortex of terror. Both Rick and Morty are depicted being sucked into a different dimension. Whether Morty is favorite character or you just love the idea of drinking hot fluids out of Morty’s head, this mug is for you. Relish in Morty’s frozen expression of fear and slowly reveal the portal. Another adventure awaits, full of awkward sexual jokes, Rick being a terrible parental figure, and the constant drama of Morty’s family. What’s not to love? If you don’t already know the show, Morty is one of the few completely sane people between Rick and the rest of the family. Though it can be argued that Morty isn’t the brightest pebble on the beach. Throughout the rather unsavoury adventures Rick drags Morty on, Morty is usually the one to point out how dangerous the situation is. He doesn’t always do anything about it, giving up all control to Rick and his sister, but he is just a kid after all.